Hillary Clinton claims Donald Trump is “temperamentally unfit” to be America’s commander-in-chief. Hence, for Democrats, add warmongering — on top of fascism, racism, bigotry, xenophobia, extremism, nativism, isolationism, Islamophobia, homophobia, chauvinism and misogyny — to their long, growing list of reasons to fear The Donald. According to them, if Trump does not impose a fascist dictatorship first, he will lead us (and the world) into a nuclear holocaust. The very opposite, however, is true: She’s the one who is blatantly unqualified to be president. This is not based on her rhetoric but upon her actions — especially, her disastrous foreign policy record. Hillary was the worst secretary of state in modern memory. Under her leadership (and President Obama’s), America ceased to be a superpower. Our influence and prestige declined at a rate almost unprecedented in history. Putin’s Russia eclipsed America as the globe’s premier geopolitical power, and communist China surpassed us as the world’s greatest military titan and manufacturing giant. During the Obama-Clinton years, the era of American preeminence — the period beginning in 1945 when the United States emerged as the mightiest nation on Earth — ended. In Libya, she supported and spearheaded a military intervention that led to catastrophe. The war was illegal, unconstitutional and criminal. The Libyan campaign never received congressional authorization; a fact that should not only have resulted in Obama’s impeachment, but in her being permanently discredited. The results of the campaign were just as bad. Secular dictator Muammar Gadhafi was overthrown and murdered. Radical Islam, however, filled the vacuum. Jihadists and Al Qaida terrorists now run large swathes of the country. Moreover, Clinton authorized the CIA to secretly arm and fund our mortal enemies. The Islamic State, otherwise known as ISIL or ISIS, is currently using Libya as a major safe haven. Countless innocent civilians — including women, children and the elderly — have been slaughtered or enslaved by Muslim militants. Their blood is on Hillary’s hands. Hillary deliberately and systematically covered-up the terrorist murder of four U.S. servicemen in Benghazi — including late Amb. Christopher Stevens. The record is clear and damning: She not only repeatedly denied multiple requests for enhanced security at the U.S. compound, but then lied to the family members of the four killed Americans. Emails show that, on the very night of the attack, Clinton told her daughter, Chelsea, that Al Qaida terrorists had perpetrated the atrocities. To the family members and the public, Hillary blamed the attack on an obscure anti-Muslim video that had supposedly sparked a riot. In other words, she is a pathological liar, who is willing to sacrifice American lives to advance her self-interest. Benghazi is symbolic of Clinton’s appeasement of radical Islam. She openly backed the Arab Spring, enabling Muslim fundamentalists to seize power across the Middle East and North Africa. Egypt was sacrificed to the Muslim Brotherhood. Yemen, Tunisia, Lebanon, Somalia, Sudan, Turkey, Nigeria — Muslim militants ceaselessly expanded their influence and growing strength. She also directly enabled the rise of ISIL. As a senator, Hillary supported the disastrous decision to invade Iraq. Yet, as secretary of state she did something even worse: She snatched defeat from the jaws of victory. President Bush’s surge had worked. Iraq was becoming stable; a fragile political order was taking hold. Then Obama and Clinton — in the face of explicit warnings from top U.S. generals and Iraqi leaders — precipitously withdrew all American forces. This allowed ISIL to rear its ugly head, its Islamist cancer metastasizing across Iraq and Syria. ISIL’ genocidal rampage has resulted in hundreds of thousands dead, millions displaced and scenes of savagery and beheadings reminiscent of Medieval barbarism. The ancient Christians of the Middle East are on the verge of extinction — a modern-day Holocaust. All this and so much more — the failed reset with Russia, China’s unchecked military expansionism, the quagmire in Afghanistan and the suicidal decision to allow Iran’s mullahs to eventually acquire the nuclear bomb — can be laid at Hillary’s feet. Meanwhile, as she sold America’s interests (and national honor) down the river, Hillary and Bill Clinton used the Clinton Foundation as a slush fund to amass over $200 million in personal wealth. Hillary used her office to line the Clintons’ pockets. Nothing was off limits: influence peddling, bribery, the selling of access and abuse of power. And this rampant criminal behavior depended upon one thing — secrecy. This is why she needed to set up a private e-mail account on a personal homebrew server. 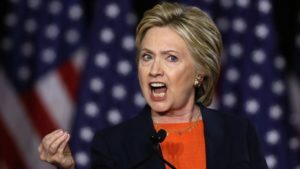 Her criminal enterprise could only be run in the shadows; her parallel email system had to be established in such a way as to avoid transparency and accountability. And when her off-the-books email system was discovered she did what all good crooks do: destroy the evidence. Over 30,000 emails were permanently deleted; hard drives were wiped clean; and all of Hillary’s cronies are refusing to cooperate with the ongoing FBI investigation. That she mishandled classified information — a serious crime — and allowed America’s enemies to be able to hack into and acquire sensitive, top-secret information means nothing to her. Hillary is more than just a corrupt, sleazy Democrat. She is a Balkan-style political gangster, who will do and say anything to achieve power, fame and wealth. She is an oligarch. Her goal is to transform America into a socialist mafia state. She has no business being anywhere near the presidency. There is only one place for her: prison. Jeffrey T. Kuhner is a columnist at WorldTribune.com and the host of “The Kuhner Report” weekdays 12-3 pm EST on WRKO AM-680 in Boston.